If you’re facing criminal charges of any kind, it’s important that you fight back with the same ferocity that will meet you. Building a strong case, hiring a tough lawyer, and following all the right steps will help to ensure that these charges will soon be a thing of the past. When it comes to attorneys in the Dallas area, the Law Offices of Mark T. Lassiter may just be your best bet. A criminal defense lawyer at the Law Offices of Mark T. Lassiter will thoroughly review the details of your case and will help you navigate the legal process. We even offer a free consultation to get you started. Nothing should stand in your way of contacting an attorney and getting on the right path to justice. Since 2006, the criminal defense attorneys at the Law Offices of Mark T. Lassiter have effectively represented thousands of people in Dallas and all over the state of Texas. Over the last 12 years, we have garnered a national reputation for our significant verdicts and settlements and our efficient and successful approach to tackling the most complex areas of criminal law. We have consistently been chosen as Texas Super Lawyers, ranked by The National Trial Lawyers as Top 100 Lawyers and uphold an AVVO rating of 10.0. Our team is compassionate and professional and we don’t judge you for simply picking up the phone or walking through our doors. It’s our conviction in the belief that you’re innocent until proven guilty that has driven us as criminal defense attorneys for these past ten years as a firm. For more than 12 years, the Law Offices of Mark T. Lassiter has been a fixture in the Dallas community. As many of us are Texas natives, we’re familiar with the city of Dallas and its residents, we grew up, built our practice, and raised our families here. We’ll fight to protect the rights and defend Dallas residents who have been accused of any crime. If you or someone you love is facing a criminal charge, contact the Law Offices of Mark T. Lassiter for a free consultation with a criminal defense lawyer. We approach criminal charges aggressively and have successfully represented hundreds of people facing serious allegations and are prepared to do the same for you. Contact us today for a free and confidential case evaluation by filling out our email form or by calling us at (214) 845-7007. Criminal charges are serious and can have life-altering effects for both you and your loved ones. After a charge has been brought against you, you’re likely reeling with questions. How am I going to pay the fines for my charge? How will I be able to apply for a job? How will I be able to provide for my family if I’m in prison? It’s an unfortunate reality that convicted criminals have even their barest rights stripped away from them and the accused often deal with faltering or failing relationships, even before they ever step into the courtroom. With the help of an experienced attorney, however, it’s possible to have charges dismissed or even reduced; you’re unlikely to acquire the best possible results that you deserve without legal representation, so this step is crucial. People who have an attorney in criminal cases are much likely to have the severity of their punishment reduced or eliminated. For this reason, we always recommend that those who are faced with criminal charges seek the legal guidance from an experienced and aggressive attorney. The legal process can be excessively daunting. Let us handle the paperwork, phone calls and negotiations so that you don’t have to learn the ins and outs of criminal law. Our initial consultations are free, so contact the Law Offices of Mark T. Lassiter today. Why choose the Law Offices of Mark T. Lassiter to handle my case? 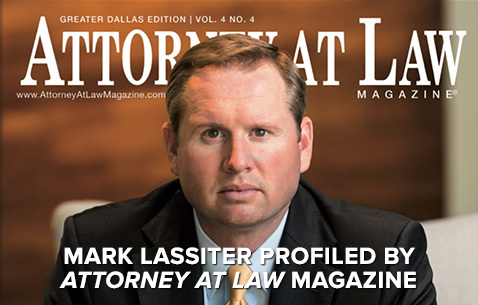 Experience: The Law Offices of Mark T. Lassiter was founded in Dallas in 2006; few firms in the area can claim to have reached such high levels of national acclaim in a little over a decade. Each of our attorneys and every member of the legal team are highly qualified and prepared to handle the complex nuances of your case. Track Record: Ultimately, you want a lawyer who is able to achieve exceptional results. Our attorneys have a record of success handling criminal law cases and consistently obtaining dismissed and reduced charges for our clients. Read our recent results to see how Mark T. Lassiter has achieved excellent outcomes in his clients’ cases. Client Satisfaction: The legal team at the Law Offices of Mark T. Lassiter take a unique approach to providing legal services. We’re not solely concerned with garnering exceptional results for our clients, but rather we hope to do so with sincerity and compassion. Our entire staff works hard to ensure our clients have everything they need throughout the legal process. See what our past clients have to say about our approach to providing legal services in their testimonials. Our award-winning team: The criminal defense attorneys at the Law Offices of Mark T. Lassiter have earned national recognition for their work on behalf of those confronted with criminal charges. We have consistently been chosen as Texas Super Lawyers, ranked by The National Trial Lawyers as Top 100 Lawyers, and uphold an AVVO rating of 10.0. We are also a part of the American Association for Justice, members of the Dallas Bar Association, and the Dallas Criminal Defense Lawyers Association. Your future is too important to leave anything to chance. As such, it is important to make sure that you have a committed team of experienced criminal defense attorneys supporting you if you are facing criminal charges of any kind. It’s incredibly difficult to say how long you will need to fight an accusation. The longest criminal court case recorded in the United States took seven years, but most processes run through to completion within a few months. Some are shorter, and some are longer than this. Many of the determining factors depend on what crime you were accused of, whether it’s a federal or a state crime, whether it is a felony or a misdemeanor, among other things. It is best to consult with an attorney regarding this question as they will be able to give you a more accurate idea of how long it may take. We understand that a criminal charge can alter your life for years to come. The fear of having to pay significant fines and potentially facing jail time are frightening and stressful consequences of a criminal conviction. Additionally, friends, family and coworkers may begin to perceive and treat you differently which can have a severe impact on your emotional and mental health. The Law Offices of Mark T. Lassiter have the utmost sympathy for families facing legal chargers. The fear of losing your current freedoms and having your personal rights taken from you can be difficult to reconcile with. The legal process can be exceptionally intricate and difficult to understand. We want our clients to feel well informed and taken care of as we pursue justice in their case. If you have been charged with a criminal offense, you need to contact an attorney as soon as possible to ensure that your legal rights and freedoms are upheld throughout the legal process. At the Law Offices of Mark T. Lassiter, we know what it takes to represent people facing a wide range of offenses effectively, and we are ready to put our dedication to work for you. We’ll fight to protect the rights and defend Dallas residents who have been given criminal charges. If you or someone you love is confronting a criminal charge, contact the Law Offices of Mark T. Lassiter for a free consultation with a criminal defense lawyer. We approach criminal charges aggressively and have successfully represented hundreds of people facing criminal charges and are prepared to do the same for you. Contact us today for a free and confidential case evaluation by filling out our email form or by calling us at (214) 845-7007.